Captain Joanna Lowe of the Royal Army Veterinary Corps is currently deployed to Afghanistan, working as a vet on the ground with the Provincial Reconstruction Team. 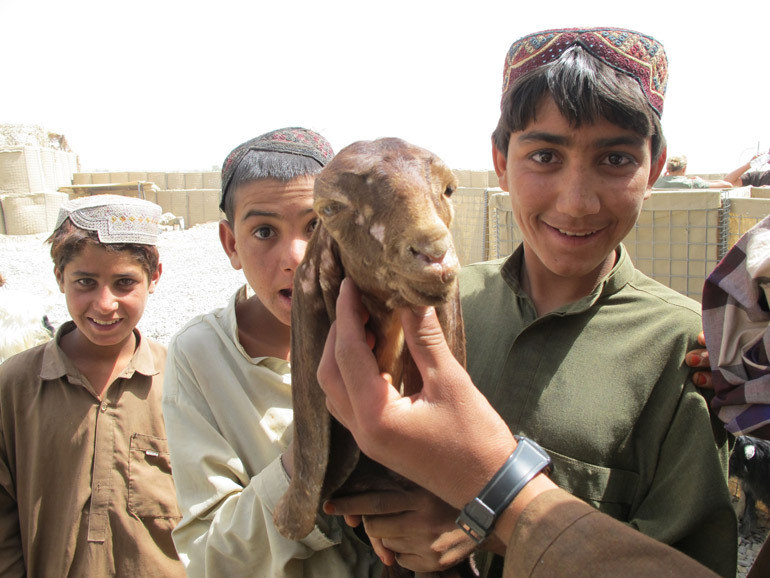 Here she writes about a Veterinary Teaching Initiative which has been trialling the education of farmers in a rural part of Lashkar Gah with unexpected success. Veterinary Engagement clinics have been the backbone of my tour in Afghanistan thus far – clinics where farmers can bring their livestock for check-ups, advice and preventative treatment, and also the vehicle through which we have been trying to educate locals to improve their animal husbandry techniques. However, with newly trained paraveterinarians (local nationals who have received a six-month veterinary training package) due to complete their training within the next few months, it was imperative that the ISAF-led clinics worked to support these fledgling businesses, rather than provide unhealthy competition for them. The Veterinary Teaching Initiative is a project I have been working on for some time, and last week saw the first trial in an area of rural Lashkar Gah known as Qal’eh Bost. The idea was that farmers would receive training in basic animal husbandry techniques (which I have found out through running the clinics are surprisingly lacking in many areas) so as to enable them to improve the productivity and mortality of their livestock for themselves. A small veterinary section of the package would explain the benefits of preventative veterinary medicine (mainly vaccination and worming) and help them to identify situations where prompt veterinary attention would be advisable. This information would not only help the farmers to maintain healthy herds, but would also benefit the new paraveterinarians by promoting effective use of their services. I had broached the concept of providing teaching for farmers before at Veterinary Engagement clinics, but had been given a multitude of reasons (from the local farmers themselves) as to why it wouldn’t work, ranging from the notion that the Taliban would try to stop it to ‘We are uneducated people so we can’t learn’. As a result it was with some apprehension that I approached the trial. I had hoped that between 10 and 15 farmers would turn up to each of three teaching sessions run over the 48-hour period – an adequate number from which I could ascertain primarily whether the project was viable, and from whom I could obtain useful feedback to improve and refine the package. To say I was surprised when a total of 220 working age farmers (accompanied by herds of children, as is typical) turned up would be an understatement. Offered no incentive other than education, these men had taken time out of their working days because they wanted to learn more about looking after their livestock. Among the crowd were a teacher from a derelict school and an ageing man from the Afghan National Police, both of whom had come because they owned small flocks of sheep. What I found more amazing was that people, many of whom had had no formal education in their lives, sat and gave me their undivided attention for ninety minutes despite my being female and younger than most of them. Due to the fact that many people could not read or write, all of the teaching was verbal, brought to life with a variety of pictures, simple diagrams, somewhat unwilling volunteers of the woolly variety and practical demonstrations. Subjects covered included housing and nutrition, care of newborn animals and treatment of simple wounds. Teaching Afghan farmers is an unusual experience, and very different from teaching soldiers. They are proud people and will not tell you if they don’t understand something, they take offence at you ‘testing’ their knowledge so confirmatory questions are not an option; this makes assessing the effectiveness of your teaching challenging, though not impossible. And the future? Well the Veterinary Teaching Initiative concept has a lot of potential, and the results of this initial trial suggest it is something that Afghan farmers are extremely keen on. Hopefully a return trip to Qal’eh Bost will show that people have employed the techniques I taught them, thus demonstrating that anybody has the capacity to learn, regardless of whether they consider themselves to be ‘educated’ or not. Captain Joanna Lowe is a vet on the ground in Afghanistan. In her latest blog she reflects on the need to educate the farmers of Afghanistan. … teach him to fish and you can feed him for a lifetime. There has been no time in my life where that phrase has been so relevant as it is now. 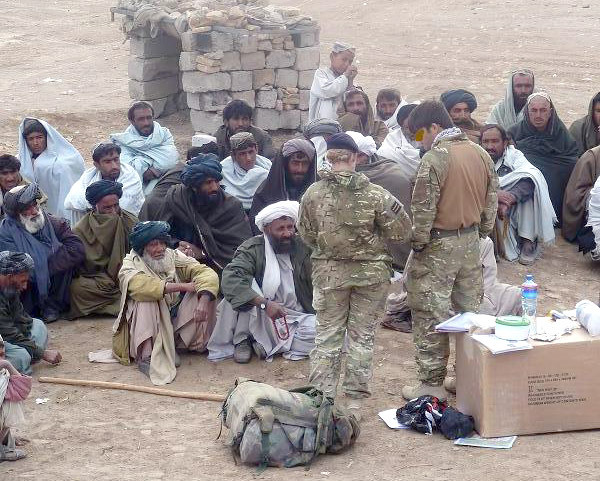 Working as the CIMIC Veterinary Liaison Officer for the Helmand Provincial Reconstruction Team, I run veterinary engagement clinics to treat livestock belonging to the local population in areas where there is no alternative provision. With over 80% of the population reliant on livestock as a source of income, the clinics are extremely well received and are excellent tools for winning consent for ISAF activities amongst the population. However, the longevity of the benefit that this affords to the farmer is limited by the duration of action of the medication prescribed, or at best the lifespan of the patient. Unless locally trained paraveterinarians are in a position to continue the clinics after ISAF have withdrawn – a state that is achievable but by no means guaranteed within this timeframe – much of what we will have achieved risks being lost. I believe that the key to sustainability is knowledge; an invaluable commodity that can be passed on through generations without ever wearing out, can be reused repeatedly without supplies dwindling and it is something that we have so much scope to provide in this setting. Education at the lowest level is something we can develop and achieve through the medium of the clinics. 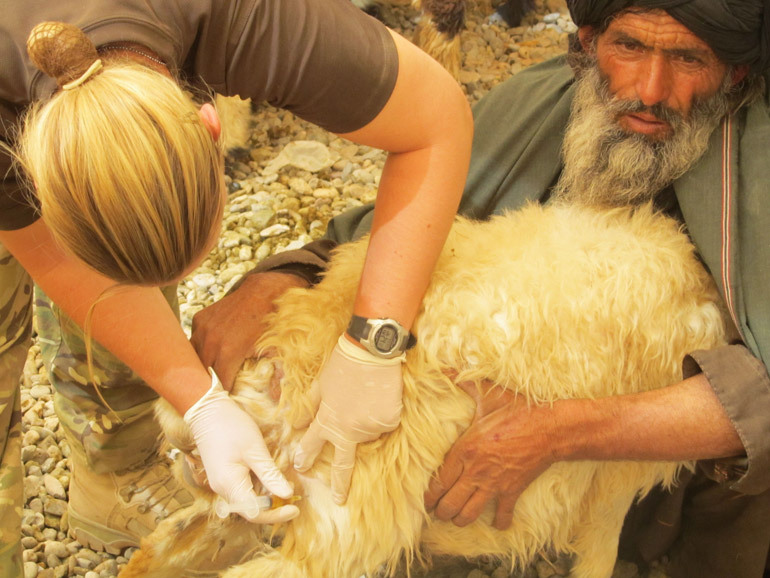 I’m not pretending it is that easy – actually I will openly admit that 99% of the time trying to teach the Afghan farmers basic veterinary first aid is not dissimilar to banging your head against a brick wall. It is hard to change the mindset of the older farmers who have firmly believed for generations that cutting the ears of a sheep will ‘let the bad blood out’, and consequently enable it to recover from it’s illness. But every time a small child listens to an explanation of why it is important to keep wounds clean, and later imitates the demonstration given by cleaning the wounds of his own small flock of sheep, it all becomes worthwhile. It is when that small child passes this knowledge onto the other children in the village, and later onto his own children, that this starts to equate to a whole host of sheep who will not be resigned to suffering the complications of infected wounds. In the bigger picture that translates to improved productivity and reduced mortality rates in herds, more food on the table and that little bit more money that can make a world of difference. This is but the tip of the iceberg of a realistic legacy that will last much longer than a lifetime. In her latest blog, Captain Joanna Lowe of the Royal Army Veterinary Corps writes about a busy veterinary engagement clinic and the events immediately following it. The most recent veterinary engagement clinic was run from Check Point (CP) Yellow 14 in the Combined Force Lashkar Gah Area of Operations. Having seen approximately 700 livestock in the morning – including two very bemused chickens, a herd of goats that had been brought in because they were ‘lazy’ and a sheep that was reported to be ‘dizzy’ – we settled down for a well deserved cup of tea. Compensation is awarded to farmers who have lost livestock as a direct result of ISAF action – for example if they are caught in an artillery strike or involved in a road collision. This incident illustrates that the farmers are aware of the scheme, but also highlights the negative effects that inappropriately awarded compensation could have. Had this farmer successfully gained the lucrative payout, I have no doubt that a dozen more sheep would have met their maker prematurely that day! What does PRT stand for again? This is the first blog from Captain Joanna Lowe of the Royal Army Veterinary Corps. 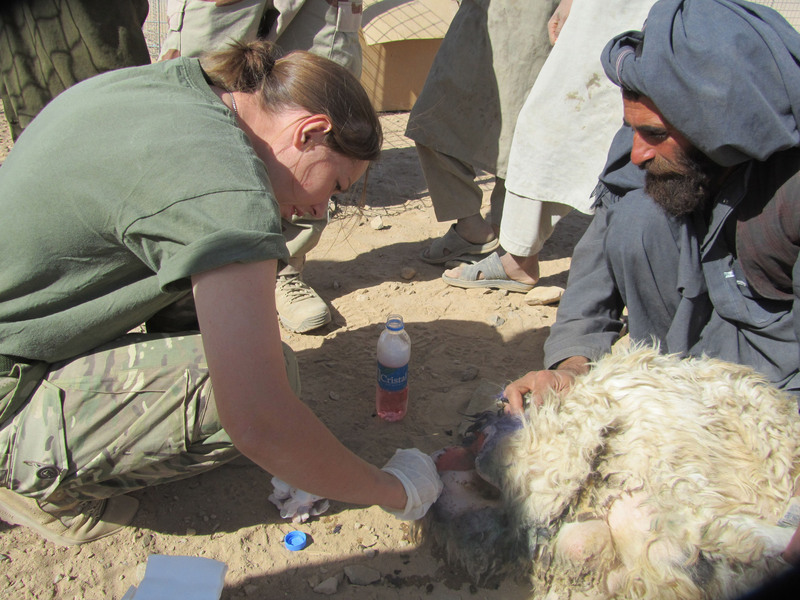 She is working as a vet on the ground in Afghanistan with the Provincial Reconstruction Team (PRT). What actually happened is that I have been detached from my unit and attached to the Helmand Provincial Reconstruction Team (PRT) as the Civil Military Cooperation (CIMIC) Vet Liaison Officer (LO) for Operation HERRICK 13 – a different ball game altogether. My role is hearts and minds-based, and ultimately aims to support the development of the Afghan veterinary system. But simply providing treatment for the livestock held by local national farmers (mainly sheep, goats and cattle with the odd donkey or camel thrown in for good measure) is just the tip of the iceberg. I have found myself collaborating with a whole host of civilian-run departments within the PRT and investigating the reach of various non-governmental organisations (NGOs) operating in the veterinary field. Over the past few weeks I have really had my eyes opened to a whole world whose existence I had previously barely acknowledged. In a conflict such as this, where the key terrain is undisputedly the population, it is hard to understate the importance of the role played by the PRT.